The Mask 1994 Coco Bongo Large Entrance Door Prop COA. This large gold door is made of a wood door frame with a molded Fiberglass pictures of the club mascot along the front and back sides. This hand made prop "Coco Bongo Large Entrance Door" constructed for the filming of "The Mask 1994" for the Coco Bongo nightclub scene which is a major focal point of the film. It features a wonderful detail and solid make. This Coco Bongo Large Door is in very good condition with signs of production use and light surface damage. 93 Tall X 43' wide. All Vintage and Antique related items are guaranteed to be original period pieces and made by the designer listed. Each item has been appraised and authenticated by one or more antique dealers in the West Los Angeles area. Some items may vary in color or appearance from actual picture. Many of our Modernist items were used as Props in TV and Movies. 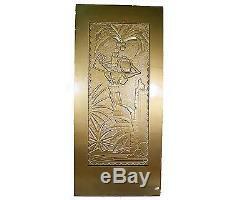 The item "The Mask 1994 Coco Bongo Large Entrance Door Prop COA" is in sale since Thursday, November 11, 2010.